Last wednesday was a bad day for me. I like Wednesdays, but it was not a good one, unluckily. Had nothing to do with being Wednesday, though. It was a bad day in itself, one of those starting with foolish actions leading to a huge misunderstanding which ends up causing sorrow. Anyway, it’s already Friday and I know it’s going to be all right, if only cause the week is almost gone and, most of all, because, as The Cure song said, “It’s Friday I’m In Love.” Looking forward to the rest of the weekend, but in the meantime I’m going to share now this song called “Bad Day” to exorcise last Wednesday’s misfortune. Copyright © Universal Music Publishing Group, Warner/Chappell Music, Inc.
A great song that reminds a lot the same sheer devastation of another REM’s tune, “It’s The End Of The World As We Know It (And I Feel Fine)” which seems to have been inspired by the primitive draft of this one. The song criticizes the shameless corruption seen all over our current world in the same breakneck pace of overwhelming news coming from our TV sets. Extreme differences between rich and poor, people being jerked around, greedy politicians and disgusting power abuse are reflected in the same unassimilable way TV news come to us. Anyway, didn’t like to end this post in such a discouraging way, so I am sharing also this much more optimistic vision by the same band, with blessings to you all, Shiny Happy People of the WP community (the video I included here was blocked due to copyright issues, so I have changed it now for “The One I Love,” another beautiful uplifting song by R.E.M.) Happy Weekend. R.E.M. line up is: Bill Berry, Peter Buck, Mike Mills and Michael Stipe. I will mention as a curious fact that Bill Berry, one of its members, was born in Duluth, Minnesota, just like the recent Nobel Prize, Bob Dylan. I have always loved Louis Armstrong singing voice, ever since I was a child. Maybe I was listening to him on the radio, or may well be my elder brothers had some record of his, but all I know is that I was used to that deep voice so beautifully hoarse. Later on I recall we treasured a 7 inches 45 rpm single of “What A Wonderful World” by himself that we used to listen to on our ‘pick up’ (as we called our turntable) several times a day once in a while. I can’t help but being a dreamer, that’s true. One of my favortite quotes ever is that Bob Dylan line, “I’ll let you be in my dreams if you let me be in yours.” So why I love this lyrics and the emotional way Louis Armstrong sings them in this live version. What strikes me the most about is that he’s asking her to do it, not in order to make amends and build a much stronger relationship, but kiss him a goodbye. So that means he will dream about her in his own imaginary world where he may feel protected and safe from reality. It says he would rather live alone with his fantasies, weaving romances, making him believe they are true. Interesting, because, back to a Dylan reference, he chose to live inside the Gates of Eden without her, instead of outside with her. I know, it sounds cowardly, just like a cop out, but I believe it helps once in a while. Sometimes we need to live our dreams all alone, escaping a real life that hurts. It’s a much complex affair, since we can not live with our feet off the ground for so long. We need to land and go on with our daily struggle. But let’s be ourselves a little bit romantic and allow us to dream of a paradise where our most beautiful fantasies come true. We can do that, at least while the song is still sounding. Close your eyes. Just one moment to think of her (or him, if you rather like a man) and imagine her (his) lips so close to yours. Then go on and ask her (him) to kiss you tender, A Kiss to Build a Dream On. You should all read and share this brilliant article about the life within the artists that actually speaks by themselves, because it talks about the real meaning of art itself in the most insightful way one could imagine. Few days ago, trying to chase away the ‘fall blues’, while having my morning coffee I have noticed that finally the sun was rising above the sky, which faintly promised for a pleasant weather for the rest of the week. Taking another sip of my latte – still feeling quite uninspired- I said to myself – ‘I wish something spectacular has happened’. When I opened my mailbox, I’ve noticed that there was something waiting for me there. It turned out that my blog had few new ‘followers’ which, of course, made me very happy. Among them there was an alert about a writer called Kim (author of a very nice online read called ‘Peace, Love and Patchouli’). It never fails to beguile. There’s really nothing I would rather do. The song already says it all. We all know how it feels when we have come to know someone that really means something bigger than life itself. It’s just a wonder, as the song reflects so well, knowing things are going fine, thinking everything is going to be alright and that particular someone might love you too. It makes you feel joyful and plenty of energy. You go thinking and thinking and thinking again, filled up with tenderness, looking forward to a beautiful relationship that you hope will last forever. And this all happens even when you are aware it never worked in the past with anybody else. So I must agree, I like her toothy smile, I like the way the song is rolling. I like the way this is going. That magic moment in the beginning when he takes the harmonica and blows out the audience’s minds, it’s unbelievable. Something out of this world. How he feels into the music and makes that sign to the drummer with his arm, his hand asking him to stop and wait ’til he’s done with his mouth harp solo, that’s simply amazing. It sure exemplifies the versatility of his talent, the greatness of a genius. Here’s the link to a sequence of Pat Garrett & Billy The Kid movie with Bob Dylan on it in his Alias role. Another sequence of the same movie here, where the song “Knockin’ On Heaven’s Door” is sounding in the background. Of course, the original song was recorded in February 1973 on Burbank Studios at Burbank, California, released on Pat Garrett & Billy The Kid soundtrack. Enjoy, if you like Bob Dylan… if not, don’t worry, nobody cares. But still a pity someone is missing the privilege of such a pleasure to our senses. Happy weekend to all of you, dear readers. Anyway, these are really great news. He’s the first singer/songwriter to be awarded with such a prestigious prize. From now on they will have to consider that poetry and music (song’s lyrics) are intimately linked and have a common goal: To reach the souls, to make other people feel emotions and think deeply about their lives and the human condition. 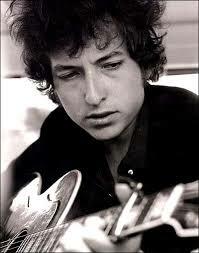 Long life to Bob Dylan. God bless him, God bless you all. This is one of the most popular Rhymes of the Spanish post-romanticist poet Gustavo Adolfo Becquer (1836-1870.) Yesterday I mentioned this verse in one of Candice’s posts at thefeatheredsleep blog (you can take a look at her wonderful site following the link.) As she wanted to know this Rhyme and be able to read it in Spanish, I promised her I would post it. I took the liberty to translate it myself to the English language, so the words might be understandable for everybody else, or I hope so. Those … will not come back! Those … will not grow up! They will not love you like that! Just a single thought that comes to mind: While it’s well known that several romanticists, such as Lord Byron and Edgar Allan Poe, influenced Bob Dylan, and also he came to read many of the greatest Spanish poets like Fray Luis de Leon or Federico Garcia Lorca, it sounds bizarre that I have never heard of any link (or read about) between the songwriter and G.A.Becquer.